And so we come to the top of the pops, the view of views. You've seen that I've few pictures from the east coast or Moray, partly because I've investigated these areas less, and partly because I believe them to be less spectacular anyway (although the old fishing villages of East Fife and Buchan are highly picturesque). Nor are there riverside or forest views: these often provide a feeling of great balance and contentment, but there is something about the wilder, wider views I've majored on that gave me a real buzz on seeing them for the first time. I've concentrated on the west coast, without apology. And number one follows in that vein. Where? You ask. It is a low hill between Achiltibuie and Altandhu, with a transmitter track running most of the way to the top, and I only climbed it by chance because it is a Marilyn I hadn't bagged, and after a longer walk in the area I had an hour to spare before sunset. 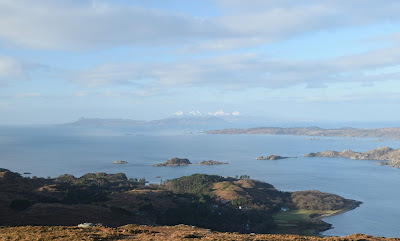 It's completely obscure, and yet has the best panoramic view I've seen in Scotland: An Teallach, Torridon and the Summer Isles south; Lewis west; the straggle of houses of Achiltibuie east with Beinn Dearg behind, and to the northeast, the whole Assynt-Coigach foreland, each individual peak visible. Go just before sunset, take a blanket and camera and a hipflask, and enjoy sunset from this perch. It's not somewhere a standard photograph does justice to, as the view is not framed by trees or slopes. It bleeds out the side of your peripheral vision and you'll turn and turn like a weathercock taking it all in. Now we are warming up! First time I went to Tioram, I loved it. A romantic ruin (it was burned by the clan chief as he believed the 1715 Jacobite rising he was honour-bound to take part in was doomed to failure and he didn't want his house to fall into government hands) on an tidal island, Castle Tioram is lovely, more picturesque than the famous Eilean Donan Castle, yet tucked out the way and very little known. But I was frustrated at sea level, thinking that I wasn't quite seeing the whole picture. Back home I looked at a map, and it occured to me that the steep hill behind the castle might provide a better viewpoint. On returning, I walked past the castle, up into a tangle of rhodedendrons - following a vaguely clear route through this jungle, someone had been here before - before finally popping up out the vegetation to a fine viewpoint. Not just the castle was in view, but as an unexpected bonus, so were the islands of Rum and Eigg: and in the foreground purple rhodedendrons completed the picture. I could not have been more pleased with a speculative search for a view. This is the other candidate for most picturesque castle in Scotland. The best viewpoint is from just below the summit of Sheaval. I can't completely decide, but think Tioram shades it. This probably shouldn't be in this list... I've seen this view, but my camera wasn't working the day I walked up Liathach, so this picture is reproduced courtesy of Douglas Wilcox. You breast the ridge from the standard ascent route and the view north over the individualistic hills of North Torridon takes your breath away! You'd think you were in the wild mountains around Narvik rather than in couthy auld Scotia, especially in winter. I would like to return, and take this picture for myself. But what you may not have seen is the best view of the lot, that from Beinn a'Chrulaiste. 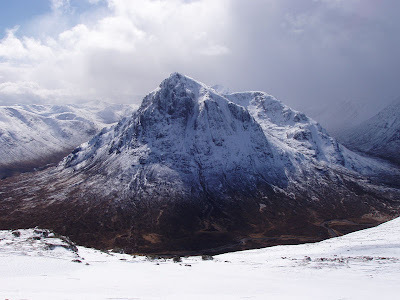 Beinn a'Chrulaiste is an unassuming pudding bowl when compared to the Buachaille opposite: and yet it provides the best perch from which to contemplate the Buachaille. Boswell, I said in my book, to the Buachaille's Johnson. The view from the Black Corries is good: but that from just to the southwest of Beinn a'Chrulaiste's summit is even better. Duncryne, known locally as the Dumpling, is the best viewpoint in the Lowlands. Perhaps that's cheating though, as the view is of the Highlands. It's small, steep bump sits above the village of Gartocharn, and was a favourite of the outdoor writer Tom Weir. And yet it remains a local hill, with few visitors. The lack of information and short ascent probably put most tourists off. However, as a quick shot of scenery, it can't be topped. Arrive on the abrupt summit and POW! Loch Lomond hits you in the eye, laid out below, islands and hills and water just the perfect size to take in in one glance. You'll feel like hugging yourself if you go up on a clear day. 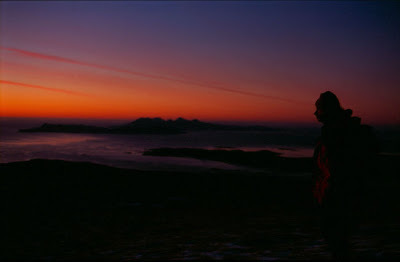 For years I wandered around the Firth of Clyde, looking for the best view. Hill of Stake, Dunrod, Bishops Hill, the Free French memorial at Gourock, on and on it went, none quite doing the job. It turned out that the best view of the Firth of Clyde wasn't from the top of any hills: the Quadrocks, looking over Arran, Bute and Cumbrae, was probably top. Until I walked from Glen Fruin over the hills between the Glen and Helensburgh, and stumbled on the view above near the treeline of Highlandman's Wood. I love the interlocking green peninsulas and the snowy Arran peaks, though the poor-quality scan doesn't do the pic justice. One day I'll go back and take it again, but the memory of the boggyness of the surrounding slopes puts me off a bit. But I think my favourite view of them is from the beaches between Arisaig and Morar, and the best of these is probably Bunacaimb beach. The sand is pale, the water shallow and full of sand-coloured flatfish. It is a great place for a long weekend camping, especially in May or early June. 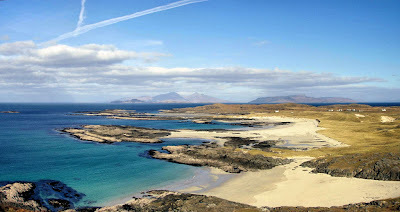 People who holiday in this area come back again and again, drawn by the beauty of the scenery, but also by the peace: for compared to Fort William, Inverness, Glencoe and Skye on the tourist trade routes, Arisaig is practically deserted. A mystery, when you look at it. And there were others: Inner Sound from Bidean a Coire Sheasgaich, or the Five Sisters of Kintail from the hill road on the north side of Loch Duich, but I realise this is a top 10, not a top 20 or 30, and so reluctantly have to chose one viewpoint. And for this I'm going way up north to Shetland, home of much of the best coastal scenery in the country. The area around Eshaness is especially notable: low seacliffs with a blowhole behind, and the unusual seastacks of Dore Holm (with a hole through the middle) and the Drongs. The Drongs really are unusual, looking like the superstructure of a sunken battleship, wave battered and a focal point for the eye. As I made my way back from a walk along the cliffs north of Eshaness, sunlight briefly shafted out of the cloud to illuminate the Drongs. I stopped and grabbed the camera and took this picture. Seconds later, the light was gone. Anyway, I'm here to talk about the picture at the top of the page. There's a classic view on the old Royal Bank £1 note, of Edinburgh Castle with the Art Gallery on the Mound below. I quickly realised that the view wasn't possible from Calton Hill: the Balmoral Hotel is in the way. Solution? Go to the Balmoral Hotel, walk brazenly past reception, up to the attic floor, drag a chair over to a west-facing skylight, and crawl up and out for the view. It might not be the best view in Edinburgh, but it is my favourite 'bag'. I saw this in a picture book, Colin Baxter I think, and copied it. The light is only right in the late afternoon. City views are often difficult to take: traffic and street furniture gets in the way, and in a city like Glasgow, where many of the glories are at roof level, an elevated viewpoint is a bonus. The answer is to go high. There are plenty buildings in Glasgow with great views from upper windows, so think about what you want to photograph, look for buildings opposite, and away and do it. This particular picture was taken from the tower at the top of Garnethill belonging to the School of Art. I simply walked in and up the stairs, and saw this view near the top. Ironically the School of Art itself also has an amazing skyline, hidden from view by the old cinema on Sauchiehall St. I went to a building on Blythswood Square opposite, intending to access the upper floors and take a picture of the School of Art, but was repulsed by a security guard. Maybe next time. This might be an even better viewpoint than that of Park Circus, I can't decide. It is important to drop down a little from the viewpoint indicator at the top of Queens Park - which has a fine view north and east - go past the trees in the way - and this fine view northwest opens up. You wouldn't know about it unless you'd had a wee poke about the park. Drumlanrig Castle is a pink confection set in acres of forest and surrounded by tweedy Border hills. Most views are close-ups of the castle from the drive, but I had seen an amazing distant view in a calendar and wanted to capture it for myself. I could tell that the viewpoint was somewhere in the forest to the southwest of the castle, and the first evening I visited, I took the car up the private forest track, expecting to see the viewpoint open out at any moment... but it didn't, and I found instead that I was back on a public road. Next time I visited I took the car again, took a different turning, the forest track branched - which way should I go? I drove on aimlessly until, beyond a hummock, I saw a break in the trees. My spidey sense tingled. This was it! Abandoning the car on the track, I ran up the hummock, and there was the castle. The designers of Drumlanrig's policies had not let their sense of the picturesque down. I took the picture and regretfully turned back without waiting for my picturesque sensibilities to be fully aroused, as the car was blocking the track. Drive round the Electric Brae and you get a great view of Culzean Castle, with Ailsa Craig beyond. Unfortunately you need a pararazzi-stalker type lens to take this picture. Go early on a summer evening. Photo hunting, for the solitary type, can be a satisfying sport. A large part of the fun in taking landscapes is in poring over maps, referencing previously published photos, and working out how an area might appear on the ground in particular weather conditions. Perhaps a particular, well-known landmark, might look even better from another viewpoint? You go and have a look for the less obvious view: always worthwhile, even if it is no better than the classic view. Urquhart Castle from above - damnned telephone lines! Once you have got to your site, you have a scout around for the actual best viewpoint - then decide under which conditions it would look best. Perhaps, you think, this particular scene would look best in winter, in the morning, with a little bit of cloud to the left of the picture. You return repeatedly, hoping for the right weather, sitting on a rock for hours just waiting for a break in the cloud. Those viewpoints that require several visits before revealing the exact right light are the most satisfying, as being the hardest earned. After the hunt, the actual taking of the photograph is almost an afterthought. Needless to say, this requires a great deal of patience and time, often at antisocial hours at dawn or dusk, halfway up a mountain. I don't take as many pictures these days as I did when I was home from my job offshore, and there are still plenty virtual pictures untaken by myself. The Cobbler from the hills opposite, at dawn, with snows glowing pink, is one. Stirling Castle from the golf course opposite, sunpainted in the afternoon with the Ochils in shadow, is another. These days it can all get a bit high tech - there is even an application where you can test virtual viewpoints with accurate sun positioning from the comfort of your PC chair. Now that I take fewer pics, this seems over the top. But it is easy to see the appeal to the amateur photographer. So in the next few posts I want to show you my own top ten viewpoints. These aren't necessarily the most famous ones, the Eilean Donan Castles and the Coire Ba across Rannoch Moors seen on countless calendars. They are my own personal favourite viewpoints, a few quite famous but others not so, ones I've come across either serendipidously or through planning, patience and perseverence. The East End of Glasgow has an unenviable reputation. A couple of recent Westminster by-elections have casued metropolitan commentators to spill much ink caricaturing the heavy smoking, heavy drinking, pie eating and drug taking 'Shettleston Man', mythical denizen of the East End of Glasgow, who at 63 (59 in some areas) has the lowest average life expectancy in Britain. With all the negative press, you'd be forgiven for thinking that the whole East End is a giant no-go zone. 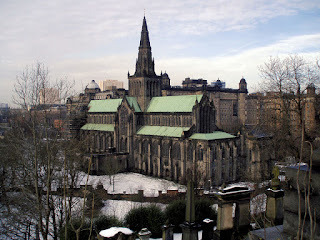 But the area is huge, a third of Glasgow, and there are plenty of nice spots. Take a look round the East End yourself. A part of the East End's problem (and it is the same with the South Side), is that it is separated from the centre of Glasgow by a mile of no-mans-land, of wasteground, warehouses and low windowless pubs. Nobody would think of walking to either the East End or the South Side for pleasure, whereas the West End is still connected to the centre by busy residential streets, uninterrupted by gap sites. People who live in the West End (affectionately called 'Wendies') have a fear of going south of the Clyde or east of High St. Both areas are well off their mental map, and these blanks are filled not with dragons, but a mental image of Shettleston Man, shooting up in a high rise. It is nonsense to think of all the East End like this. But look carefully at a map of Glasgow from the 1960s, compare it with today's map, and the justification for the Wendies prejudice becomes clear. Large parts of the city south and east of the Clyde have become wasteground, with former factories and housing knocked down. The West End, in comparison, has continued to grow, with new flats along the Clyde near the SECC. Glasgow has become Wendified, and Shettleston Man has had to look (or live) further afield for employment. This post is an update. A couple of years ago I wrote a poem about the Falls of Clyde. It wasn't as good as it could be. It still isn't. My poems usually need edited, and I've found this happens over the course of many years. Perhaps, as I get older, it will happen over many decades. Perhaps my teenage output won't be worth reading until I'm eighty. Having read some good poets recently, I realise how far my ditties fall short. The Merry Muse's best friend is good old Effort. 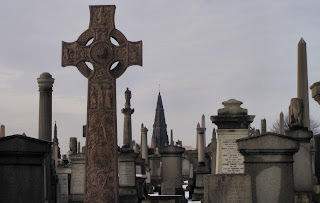 Tourists thrill to the legends of Edinburgh, of bodysnatchers and murderous respectables, of faithful Greyfriars Bobby, of Mary Queen of Scots and John Knox. B-o-r-i-n-g. Becuase Glasgow has its legends too, with the bonus that they are often free from the dull constraints of truth. As a student at a Glasgow university, I was informed that one enterprising first year had recently spent his grant on a fortnight's holiday on the Costa del Sol: on returning he was skint, and subsisted on pasta alone. He fell unwell towards Christmas, and went to the doctor for some medicine. "You've got scurvy," the doctor apparently said. 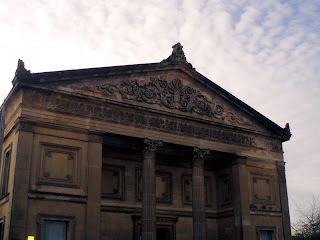 Or take the case of William Simpson, architect of the Kelvingrove Museum and Art Gallery. So upset was he that the museum had been built back to front, that he threw himself from its towers. A Glasgow Legend need not be true to be embraced: just a good story. I remember standing in Queens Park, a grand lookout over the city: a woman standing next to me pointed out a new cinema to her friend. "That's the tallest building in Britain," she said. She'd got her story mixed up: it is the tallest cinema in Britain. It is far from the tallest building. This should not have to be pointed out - clearly visible from Queens Park are taller buildings in Glasgow itself. But the woman's friend said nothing and, though bursting to correct her, neither did I. Why ruin an interesting fact with the truth?